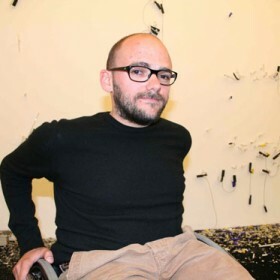 Ryan Gander (* 1976 in Chester, UK) lives and works in London. Following his studies at Manchester Metropolitain University, Gander held residencies at Jan van Eyck Akademie in Maastricht and Rijksakademie in Amsterdam. In 2008, a major solo show, Heralded as the new black, toured Ikon Gallery, Birmingham, South London Gallery and Museum Boijmans Van Beuningen, Rotterdam, while other solo exhibitions were presented at Kunst Halle Sankt Gallen and Kunstverein Bonn; his work was also included in the Carnegie International, Pittsburgh, and the Sydney Biennial. In 2009, Gander will present solo exhibitions at Villa Arson, Nice, as well as at Kadist and gb Agency, Paris. Ryan Gander is participant in dOCUMENTA (13) (09.06.-16.09.2012) in Kassel.